A game which... was so thunderingly entertaining it seemed less a football match, more a $100m Michael Bay movie - albeit one that was so gripping it didn't need Megan Fox running around in hotpants to liven it up. Make no mistake, Port Vale were formidable opponents - especially in the second half - but this isn't an Orient team that fears a challenge. Indeed, the spirit in the camp at the moment is so strong that if you distilled it even Sean Thornton might consider watering it down a bit with a mixer. Moment of magic... The look on Tom Pope's face when 'Super' Kevin Lisbie struck his late, late winner. The Port Vale striker's main contribution to the game to that point had been the sort of incessant moaning you'd expect of a silent movie-lover forced to sit through Transformers: Dark Of The Moon - well, that and somewhat ill-advisedly squaring up to Elliot Omozusi - so it was all the more satisfying to see his reaction to Orient racking up their sixth win in six. Moment of madness... The moment in the first half when the linesman raised his flag just as David Mooney volleyed into the net, only to change his mind and lower it again. Presumably he'd felt the hand of history on his shoulder and figured Moons wasn't likely to catch one as sweetly as that again in his whole lifetime so he might as well let the goal stand. Top gun... The Official Romain Vincelot Man Of The Match Award was given to Romain Vincelot today. Which is probably a bit unfair on two-goal hero David Mooney, who at present is apparently inhabiting a Pro-Evo version of himself in which an inexperienced games developer has accidentally coded him with the attributes of Lionel Messi. I'd have given it to Elliot Omozusi though, whose performance at left back epitomised the gutsy, never-say-die performance of the whole team. Little donkey... In the context of this victory it seems a bit mean to point it out, but in the build up to Port Vale's first goal, Jamie Jones punched so weakly it looked like Natalie Imbruglia half-heartedly trying to land one on a testosterone-pumped nightclub bouncer for not allowing her in the VIP area. In the dug out... Huge scenes of celebration when Orient's winning goal went in. Even Kevin Dearden ran a few paces up the touchline, though official word is that four foot-deep crater he left in his wake will be filled in by the time Notts County arrive on Tuesday. As to Russell Slade, words cannot do justice. 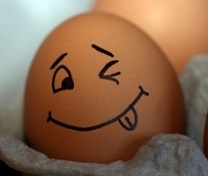 So instead here's a picture of a happy egg. View from the opposition... "Fantastic performance today by the lads - didn't deserve to lose," wrote Vale fan Dave Banks, adding hilariously: "Orient not a great team." But never mind that, let's take a moment to hail the performance of ex-O Antony Griffith, who played the game in the right spirit and was almost a match for Vincelot. 'Almost' in the same sense that Dean Cox is 'almost' as tall as the Empire State Building. Tweet of the week... This from Elliot Omozusi, entirely written in a language known only to him and a long-extinct alien race: "not being biased but @MargsT fire in the booth 100the best, man said ni#*as grab the ting n start shooting 4rm Durant range. Kevin Durant." Anyone? Orient by numbers... Seven. The number of shots on target Orient had in a searing spell of attacking play during the first five minutes of the second half - exactly six more than turn-of-the-millennium midfielder Andy Harris managed in his entire spell at the club. "I never had much luck shooting," Harris chuckled a few years later. "But to be fair I did always remind Tommy Taylor that I was actually a goalkeeper." I think a deserved mention should go to the Port Vale fan in the grey top who threw the ball away before the winning throw in from our own half which (sort of)lead to the winner..If I was hard and in that stand I may have danced like a fool and pointed joyously at him after that which may have meant this was being written in the comfort of the a+e dep't of Whipps Cross. ''the spirit in the camp at the moment is so strong that if you distilled it even Sean Thornton might consider watering it down a bit with a mixer''. I would say I ROFLed, but to be fair I LBIMCAHL'ed (Leant Back In Me Chair And Heartely Laughed). Top, on form stuff, Mr. Simpson. Great stuff as always. Also a bit of help with the Omo tweet. He is talking about a rapper 'Margs' and his appearance on a section in Charlie Sloth's radio 1 show called 'Fire in the Booth' He says it's the best one he has heard and then uses a quote from it to demonstrate how good it is. Amazing! That's much clearer now. file contents box: After you have chosen your torrent file along with the. Si deseas bajar de peso no dudes en revisar el siguiente link, no te arrepentiras! get data about my presentation subject matter, which i am going to convey in school. of boxes going into landfills. of information written in such a perfect method? I have a undertaking that I am simply now running on, and I've been at the look out for such information. before undergoing the procedure. Sometimes, our decisions could be clouded by pressure from our surroundings. on his marriagе after his admitted infidelity. delle informazioni scritte in un metodo così perfetto? Ho un impegno che sto semplicemente ora in esecuzione, e sono stato a guardare fuori per tali informazioni. Dark Of The Moon - well, that and somewhat ill-advisedly squaring up to Elliot Omozusi - so it was all the more satisfying to see his reaction to Orient racking up their sixth win in six.